Ironically, after having lamented the flattening yield curve for a year, soothsayers now lament the steepening yield curve. On Friday, capping a rough week in the US Treasury market, the 10-year yield closed at 3.23%, the highest since May 10, 2011, and stocks fell for the second day in a row. This is an unnerving experience for pampered equity investors who’ve come to take endless stock-price inflation for granted, who’d figured for years that interest rates would never rise, and as short-term interest rates began rising, figured that long-term interest rates would never rise – and now they’re rising too. To rub it in that this is a new world, similar to the old world before QE and before zero-interest-rate policy, another Fed heavy-weight discussed what’s coming: Quite a few more rate hikes. New York Fed president John Williams told Bloomberg TV on Friday that we’re witnessing a “Goldilocks economy” with strong labor market, earnings growth, “low and stable inflation,” etc. “We want to sustain this economy, we want to keep it in good balance, so we don’t want to see inflationary pressures pick up,” he said. And the topic came to “neutral” – the infamously theoretical short-term interest rate that is high enough to stop pushing the economy but is low enough to avoid slowing it. This echoes Fed Chairman Jerome Powell’s pronouncements that “we’re a long way from neutral at this point” – and he’s thinking of taking rates beyond neutral [read… Powell Explains Just How Hawkish the Fed is Getting]. The 3-month yield rose just 4 basis points to close at 2.23% on Friday, October 5, the highest since February 2008. The 2-year yield rose 7 basis points over the week, to 2.88%. The 10-year yield jumped 18 basis points, to 3.23%. The 30-year yield jumped 21 basis points, to 3.40%. 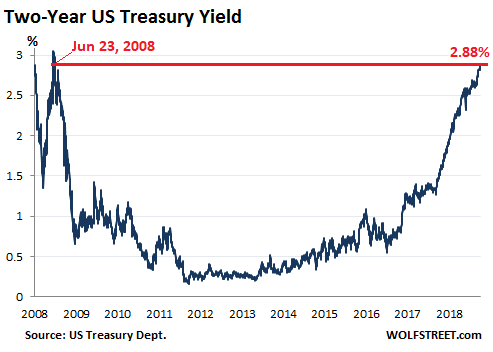 The real action was reserved for long maturities – surprising the folks that had been clamoring for a “yield-curve inversion,” where the 10-year yield would stay low, and the 2-year yield would rise above it. This yield-curve inversion phenomenon in the past occurred before recessions or worse. The last one occurred before the Financial Crisis. 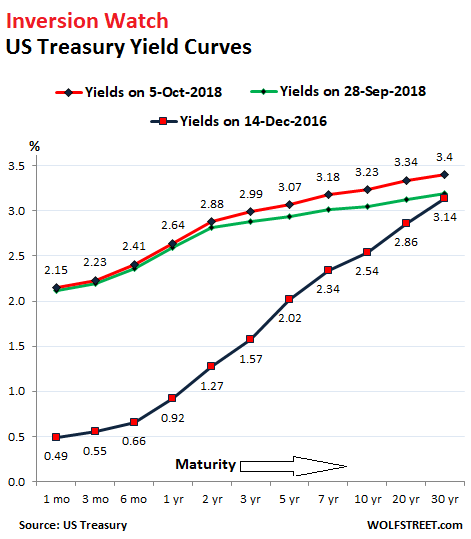 So surely, if the yield curve inverts, the Fed would quit raising rates and Wall Street could go on undisturbed, the thinking went. Consumers, whose debts, including mortgages, have ballooned by $442 billion over the past year. The federal government, whose debt has ballooned by $1.27 trillion in fiscal 2018. But state and local government debts have edge down a smidgen over the year (-$4 billion). And a 10-year yield of 3.23% is still low, though it is incomprehensibly high to those who in mid-2016, had expected it to be zero by now. And it’s going higher. The spread between the 2-year yield (2.88%) and the 10-year yield (3.23%) has widened to 35 basis points. This is still nothing to write home about, but it’s almost twice the 18-basis point spread on August 27. If the yield curve were to invert, the red line in the chart above would have a downward slope. But this yield curve isn’t ready to invert just yet. Wall Street soothsayers had been postulating over the summer that the yield curve would invert by September’s rate hike, and that the Fed, scarred by the Financial-Crisis turmoil that happened after the yield curve had inverted last time, would then quit raising rates and give Wall Street a break. 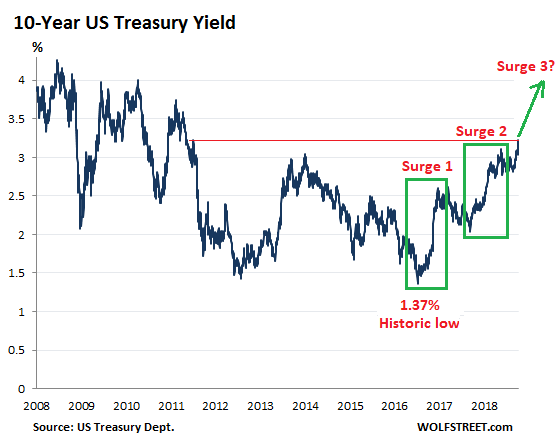 Instead, the yield curve has done the opposite – it steepened. Ironically, after having lamented the flattening yield curve for a year in order to get the Fed to back off, these soothsayers are now lamenting the steepening of the yield curve. They now fear, as long-term debt gets more expensive for borrowers and more attractive for investors, that investors might abandon stocks, and that the ludicrously inflated stock market might start hissing a lot of hot air. ->In total, indebtedness of consumers, corporations, and all governments has grown by $2.04 trillion over the past four quarters. Which appears to be more than 10% of the US economy, or more than double the rate of growth in GDP, somewhat more than 0.8 tn during a similar period. If anyone would care to hazard an interpretation of this phenomenon, I would like to see it. I think it might be interesting to see if anyone’s take on this in any way resembles my own, particularly any predictive value. Interestingly, the increases in the FFR do not seem to have much affected the taste Americans have acquired for the sweetness of debt, which sort of makes me wonder what financial diabetes looks like. Perhaps we’ll find out. Fortunately, GDP was magically revised by about $1T, which actually makes it look as though Debt / GDP has decreased (looking only at up to Q2 2018, the Fed will publish Q3 in December). The bulk of the most recent GDP revision was based on an even-more magical revision to personal income, which doubled the household savings rate. You see, the BEA now counts income that the IRS cannot find. So far, it is estimated income from proprietorships (basically, unincorporated businesses). And it is several hundred billion dollars per year. But the IRS cannot seem to locate it, so it is untaxed. The next step: Increase personal income again, by adding estimated income from true criminals (not just scofflaw tax-shirkers), such as drug dealers and prostitutes. Then the savings rate will really increase. Drug dealers and prostitutes are honest merchants compared to the true criminals – bankers. I interpret this number as 1 trillion was spent digging holes, and another 1 trillion filling them up. That’s how GDP works. Yes. An earthquake or a hurricane increases GDP because of all the broken windows etc that need to be repaired. War’s great for GDP because the whole point of war is to kill people and break things. Eisenhower laid it out plain in his famous speech, you can have X number of bombers or X number of hospitals etc. My take is the financial system is an accounting system of promises. Our financial system, i.e., the books, are about as accurate as Enron’s books. The realization that there are no assets backing the promises will come suddenly. The wealth won’t suddenly disappear. It is already gone, but the corrupt accounting system says it is still there. But I can only point out the danger, not predict the future or guess at timing. A historical average of interest rates is a GOOD thing. Businesses actually have to invest in something real for a ROI, savers are rewarded and bubbles get schlonged. How Taoist. I am encouraged to contemplate my navel until I disappear, only to unfortunately end up as a minor character in a Ralph Bakshi animation of a Herman Hesse story. The veil of Maya seems particularly elusive in matters of macroeconomics. What is true no two men know. Pricy houses should suffer a steepening slump. I am of the opinion that majority of home owners and prospective buyers have not yet done the math and when they do come the tax season prices should begin to fall even faster. They’re unaware of the impact of the rising rates, the new cap on tax deductions, and also property taxes on recently purchased overpriced houses. There are more for sale signs around and the duplex across the street sold for 10% below the asking price after being in the market for several months. I hear similar stories around the Bay Area. Is this a case of don’t panic, but if you do, panic first ? Not from my point of view. All this tells me that things are normalizing. Finally. The two and ten year spreads is slowly becoming a viable measure again, and no one will believe it because the Fed just said that it’s no longer useful. Everything has changed, and still nothing has changed. 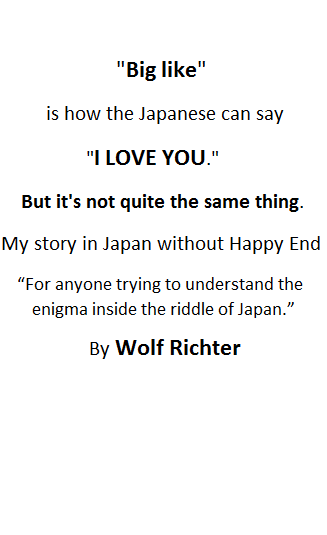 To me, it’s poetic, sad, and bloody amusing all at the same time. Is the Fed the new Bond Vigilante? Not sure its true however the realization that the decades long bear market in credit, oversupply, has made it impossible to fund government, and now we have to eat (a few of) our children. Obviously, the recent rise in long-term interest rates is due to a lack of buyers relative to the supply at 3%. Each interest rate surge pulls in another wave of buyers, which then also gets exhausted in time. How many waves will there be and where will they stop is anybody’s guess. Personally, I haven’t and won’t buy a 10-year treasury until rates are again above 4%. True, but yields are also increasing due to excessive offer: borrowing by the federal government is obscenely high and is not offset by quantitative easing any more. So that’s a lot more supply… while demand hasn’t changed much. “borrowing by the federal government is obscenely high and is not offset by quantitative easing any more.” You do realize, don’t you that both QE and TARP I evolved creation of massive new debt. But the FED can always become a buyer again by printing money. What’s the consequence of that? Increased money supply which won’t cause inflation, just like 2008 bailout? The whole monetary system seems like a joke to me! It’s an exercise in plate-spinning and basically a massive con scheme – which is kept going so the wealthy can appropriate even more of the cash, sequester it away it tax havens, and then hide when the smelly stuff hits the fan. This was always going to happen following de-industrialization and the removal of the wealth creation engine of production. Herr Marx had something to say about when money becomes an economy – I can here him spinning in his grave in Highgate cemetery as I type. The financial parasite took over, as they do when allowed by pliant politicians (and the USA now has one of said parasites as President), saturated the place with debt and will leave you to it when it goes pear-shaped whilst they go shopping in Monaco. Hyperbole/exaggeration? We’ll see before too long methinks. It’s what happens with in-breeding….a weakening of the blood. That’s when you breed bankers with politicians and disregard the stronger bloodlines of the rabble. Oh, we will pay dearly! As a more than 25 year retiree I welcome sky-high interest rates…somewhere around 6% where money doubles every 12 years? For me that is irrelevant at my age, but for those who still believe in personal conservative economic values it is mana from Heaven. (On the other side of the coin, I’m a true “keep your eye on the government and how it spends it’s money especially in privatized warfare; and remember to take care of the unfortunate in our society) No, not contradictory….just don’e make “money (financials)” the total economy like another commenter said. Isn’t the talk and execution of rate hikes just a heads up for “smart” money to begin the transition out of inflated assets and ready for the next stage of the “cycle”. As for a recession (or worse) isn’t a percent or two change (especially at these levels) mostly a distraction away from what banks are doing? Doesn’t the “health” of the economy, most importantly, come down to the YOY rate of change of bank credit? Where, at current debt levels (private/corporate/state/local being the critical ones), the banks could easily send the economy into a tailspin by simply slowing the YOY rate of credit growth (certainly a sustained 7-10% or more reduction would do it). Also, I swore I heard Dalio on BI the other day threaten a slow down if the politicians don’t come through on some private/public partnerships (aka corporate welfare cough… cough) the corporate masters are, and have been, eyeing (namely infrastructure, healthcare and public pensions). Nah, probably just nonsense (and my wondering brain) “free” markets don’t work like that. But, just for fun I may keep my eye of the YOY rate of change of bank credit. This Dalio character possibly wants the US equivalent of the Innovation Network Corporation of Japan (INCJ), a “private/public” partnership where the Japanese government provides Y102 billion out of a total capital of Y112 billion plus Y1.8 trillion in credit guarantees, and which is used by the keiretsu as a dumping ground for unprofitable divisions, foreign companies that should have never been bought in the first place and other assorted financial black holes. Yes but because they have distorted the economy for such a long time with low interest rates and rather lenient qualifications, there are a lot of Zombie companies. Ones that, under stricter standards and higher interest rates would no longer be with us. And raising interest rates are not good for them. Their balancing act more resembles a juggling act where as more and more objects are expected to be juggled at the same time. No juggler can accomplish what the FED is required to do. And the likelihood that at some point the entire collection just comes tumbling down onto the floor. MC01: I am much less convinced of the implied benevolent nature of the FED. Historically almost all stated objectives have the exact opposite effect (Prof. Richard Werner has an excellent segment on this). I am pretty much convinced that at this point the FED is primarily a tool for obfuscation and/or political cover (as required when those responsible for the fiscal side of things fail to act). What the banks are doing in terms of credit is much, much, much more important. Interesting point on the Innovation Network Corp. in Japan. I was not familiar with that. Aww come on be fair it could never be said that’s the case now could it? Stock buyback programs ‘Ponzi finance’? Nooo, never. Just sound business sense [for my stock options package, that is]. Anyway haven’t you heard – it’s a new paradigm now. The CBs have got our back whatever, and will just start stock buying programs. Which means, of course, that the solution offered by the bastions of ‘free market’ capitalism is (drum roll)…socialism, as government stock purchases represent nationalization. As B. Simpson once said “the ironing is delicious”, but the ironing of the fact that rampant capitalists are forced by their own bankrupt(ing) ideology of unlimited greed and self-interest to turn to the thing they profess to hate the most will be completely lost on those who implement these programs. Ted: Makes a lot of sense. I have Minksy on my to read list. In my more cynical (or maybe realistic) view it’s just missing the part where the head of the snake gets the ducks in row beforehand to get shorts bets on, pick up assets for pennies on the dollar and have an “emergency” contingency plan (and PR campaign) in place to have tax payer’s pick up the tab if the short bets can’t be made whole. The market would know where it is and quickly get to it, if it were allowed to be never constantly second guessed by the FED. I fail to see how 12 PHDs on at the FED know better than 300 million consumers and savers in the real economy. ->I fail to see how 12 PHDs on at the FED know better than 300 million consumers and savers in the real economy. Because a highly-educated individual is likely to know more about their specialty than a whole collection of Joe Blows off the street. It’s why you should choose an experienced surgeon to do your kidney transplant and not your bowling team, even though their kidneys far outnumber those of the physician. It is not the relative qualifications of these PhDs which should be in doubt, but their morals, their motives, and their methods. Persons of the elite class to which Fed members typically belong are often, if not usually, well indoctrinated to believe that they are entitled to their positions, and will go to extraordinary lengths and use destructive means to acquire and protect the class privilege represented by those positions. Because of the very nature of governing institutions generally, and the Fed specifically, those can be very highly questionable, and it is your right and your duty to question them and to hold them accountable if at all possible. And yet, it can scarcely be said that Fed boards are accountable to anyone but other members of their own elite class, and that is quite by design. Hardly. Their ‘stupidity’ is calculated. By feigning ignorance they can plausibly avoid admitting anything. They can keep their jobs and avoid prosecution by playing dumb and seeming harmless but not by exposing themselves as venal or criminal. Taleb’s role is to play into the deception. Greek sophists taught the techniques 2500 years ago, and it still works. Don’t buy it. Off the top of my head I think economist Michael Hudson uses the terminology learned ignorance and useful idiots, among others. His book J is for Junk Economics is “priceless”. I rarely give investment advice but feel compelled on this one. I am laddering up with 10 year treasury notes. Lightening up on stocks and buying these notes. The 10 year may have some additional room to go on yields but I will be very surprised if it holds at or above 3.5%. The economy is too dependent on cheap money and the3- 3.5% level will soon slow it down. It’s already slowing for a variety of other factors including debt saturation. Long term, I think the 10 year will move back down into the low 2’s or even lower. 2-10’s are just a proxy for the CORPORATE CURVE–which is the one that matters–and it continues to FLATTEN for reasons that are beyond the scope of a quick posting,; but revolve around FRN leveraged loans tightening even as LIBOR rises and the increasing cots of selling AAA ABS to Japanese buyers who have to hedge $USD. The flattening will continue until the CLO window slams shut, then warehouse liquidations and margin calls in zombie loans pending execution will begin and the credit market will correct HARD down stack. This is what the FED wants–tightened financial conditions in response to their policy. Stocks will not be happy–especially FINANCIALS, which should be avoided like Ebola. Interest rates are going up because US Government spending is increasing rapidly and profit from global trade is dropping. More supply and less demand. Plenty of excess reserves in Federal Reserve System to finance business expansion in the US. I predict a five year or longer boom in automation. Mostly centered in the US but that could change depending on how the World responds. Blue US states are likely to drop immigrants and embrace something else as they lose population over lack of SALT deductions. Those Fed induced reserves are phony, don’t be fooled the banks are in trouble. If reserves were based on savers parking extra money that in turn the banks would lend out it might make sense. All things technological have blowback, and the rollback in automation will put more people to work, reduce productivity, raise wages, and cause inflation, against a weakening economy. The US is leaving the global trade group, though of course information and software will grow. The jobs that are returning won’t provide a living wage, and you will have to have one to survive. Blue states will do what they always do, attract the best businesses and workers. This will begin USexit, and relegate the rest of the nation to third world status. I’m so tired of the financial world claiming “the end of the world is nigh”, if they don’t get free money from the government in order to rip off ordinary people, i.e. money at 1% to loan out to everyone else at 5%. The knife at the throat is it will “kill the stock market”, where ordinary folks now put their money, since the 1% they get at the bank is what 1/4 of real inflation? (and taxed on it to boot). All this is just a giant scam where hard working people and savers are played. They’re entitled. Class has its privileges, which includes exploiting the subject population for fun and profit in any way they see fit, and constrained only by the opinion of others who are also so entitled. Until they hear the faint grinding sharpening of the pitchforks in the dead of the night! That’s why some of us have more faith in bitcoin as a store of value (and, long term, a likely high return investment). But do your own research. As is said in the bitcoin space, “don’t trust, verify”. L Lavery: Can we please move beyond the age old sleight of hand notion of money as a “store of value”. No money “stores value” in and of itself. Money is and always has been to derivative to things people value (read actual products and services). So much economic BS in couched in this “store of value” concept which conflates purchasing power with inflation (generally implied as simply monetary inflation). The primary function of any form of money is a unit of measure which facilitates a standardized way to measure your stack and what you could purchase with your stack (ie prices in a given unit type, like dollars). Whether or not a given money thing maintains its purchasing power over time is a separate, more complex, discussion. As for the price of commodities, assets or in the case of crypto a quasi asset or synthetic commodity they go up and down vs fiat for various reasons (also a broader discussion). All I’m saying is that, as of now, bitcoin is a good store of value (as good place to store what little money I have), IMO. Whether or not money is a store of value, or should be, I don’t really care. It may be a cliche to say the Fed is irrelevant, but worth saying again. To the degree they prop up the dollar, and put pressure on EM bonds it all works. Dealing through a network of third parties you are never sure what you control (Greenspan said famously he didn’t understand how monetization works?) The high dollar policy causes rates to rise and the Fed neatly backfills at the low end. LIBOR is not irrelevant (real businessmen setting rates daily according the market ) which is why the Fed might try their own version. Again control through third party transactions, at some point you lose control. There is no such thing as a “neutral interest” rate, just like there was no such thing as a “soft landing” in the time of Alan Greenspan. A while back, I wrote several posts here about understanding the effects of the Fed Funds rate vs the Taylor Rule in terms of the feedback loop of an operational amplifier control system. Obviously a simplistic model, but gives some insights if you think like an engineer as to why the economic system will be inherently unstable and prone to oscillations, i.e. boom and bust cycles, no matter what the Fed does. Real inflation IS raging, at much higher than the official CPI numbers. The official CPI is a fraud, and not JUST for the usual conspiracy reasons of hedonics and shadowstats.com, but simply because the “basket of goods” in the CPI seriously underweights the percentage of clearly high inflation costs like healthcare, education, and home building, which now make up a huge percentage of our alleged GDP. What has kept the CPI down so low has been the over-weighting of durable goods in the basket of goods, which have stayed at low or negative inflation rates because of offshoring of production and increased automation, both best described as the dominant National De-Jobbing Policy of the USA for the last 40 years. And ultimately, because the feedback loop in this system is always reacting to things that have already happened, it is a delayed feedback loop, which in control ststems are inherently unstable and likely to oscillate. Anyone know why I can’t find a real-time quote the 10-year yield today (Monday)? Is the 10-year not trading today for some reason? All the sites I go to show the Friday close, but nothing new for Monday. Hi Bobber – the bond markets are closed today (Indigenous Peoples Day, aka Columbus Day). probably why the ten year wasn’t up another one percent. A Kiplinger “executive and investor” letter I received a couple weeks ago said that, paraphrasing, “the Fed intent is to raise rates to 6.25-6.50% in 2020”. They don’t provide a source. I will like 6.25% — but I have not seen any reference to this much hawkishness of the Fed intent. Wolf – are they pulling this from their thin air or might there be some circles that are really initiated on the Fed intent? A federal funds rate (short-term rate) of 6.25% sounds very painful. That would be four percentage points higher than today. I don’t think the Fed has the balls to do this — unless inflation as measured by core PCE goes to 6% and higher, which I doubt, but it could. And if that’s the case, and the Fed indeed raises its target range to 6.25%-6.50, if you own any stocks or real estate, you should assume a fetal position and stay in it with your eyes closed. That kind of short-term rate by 2020 would cause mayhem. Indeed 6.25% target rate seems outrageously high today and that just stuck out for me in that newsletter. But the rate was just below that range in 1995-2001… with the economy booming… so who knows, maybe it will not be so unimaginable. The most curious question for me though is whether Kiplinger may have have some sources that others don’t. it’s all a matter of confidence. Once that is lost in the government( and we seemed to be heading in that direction) then the 10 year might surprise everyone to just how high it will go. Banana republic anyone? Really enjoyed this write. And, all the commenters………who needs a “college degree” when we have blogs like this????? – Ever since mid 2012 I have expected interest rates to go higher. It took 4 more years (in 2016) for interest rates to go higher. – What remains to be seen is what happens to the behaviour of the yield curve. If rates go higher then I would expect the yield curve to behave differently than in the years since 1981. – The yield doesn’t have to invert to signal that a recession is coming. When the yield curve starts to steepen then that also signals that a recession is coming.